Please note: You will need Adobe Acrobat Reader to view these files. You can download the free plug-in by clicking here. 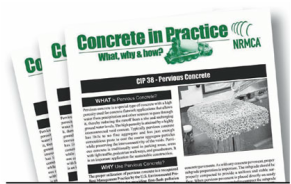 Concrete In Practice is a series of one-page information sheets on important technical topics, written in a non-technical "What, Why and How?" format. These documents have been provided for download by the NRMCA. Please note: All documents linked below will open in a new window. You will need Adobe Acrobat Reader to view these files. You can download the free plug-in by clicking here. This Material Safety Data Sheet is intended as a sample. While it represents ingredients and values typical for Portland cement concrete, concrete and its constituent ingredients vary in composition. Information on specific aggregates, cementitious materials, water and admixtures should be provided by the supplier upon request. The information contained in this Material Safety Data Sheet relates only to the specific material designated herein and does not relate to use in combination with any other material or in any process. The information set forth herein is intended for use by persons having technical skill and at their own discretion and risk. Since conditions of use are outside the concrete/concrete products producer's control, the producer makes no warranties, expressed or implied, and assumes no liability in connection with any use of this information.